This session will feature a live demonstration of Threat Hunting by a cyber threat hunter. In this session, you will see what a Threat Hunter actually does and how it is done. This session will examine IoT driven DDoS attacks and how they are generated, and what can be done to prevent them. ​​​​​​​​​​​​​​​​​​​​​​​​​​​​​​​​​​​​​​​​​​​​​​​​​​​With sensitive data residing everywhere, organizations becoming more mobile, and the breach epidemic growing, the need for advanced identity and data protection solutions has become even more critical. Learn about the Identity and Data Protection solutions for enterprise security organizations can take a data-centric approach to their security posture. This session will discuss how to control access to the infrastructure and applications — both on-premises, and in public and private clouds. What does Privacy and Security mean under GDPR and CCPA? What are the differences between GDPR and CCPA with regard to privacy and security? What controls and mechanisms can be utilized in order to become compliant with this specific aspect of these regulations. This session will delve into the requirements and best practices for a solid data breach response policy, covering when and who should be notified. This session will define the role and responsibility of the Threat Intelligence function and what tools, tactics and procedures are used as well as the various stakeholders that benefit from their efforts. How a Digital Risk Framework (an understanding of the differences between cyber security, cyber risk and digital risk) can help identify and mitigate risks to your Cloud Infrastructures. In this session you will learn what a Digital Risk Framework is, how a Digital Risk Framework can help you comply with the onslaught of privacy regulations (CCPA, GDPR, HIPPA, etc) and its impact on your Cloud Infrastructures, which are most commonly used. In this session, you will learn what the California Consumer Privacy Act (CCPA) is, what it means to your organization, how it differs from GDPR and lastly where do you start to become CCPA compliant. This session will feature a live demonstration of Threat Hunting by a former Federal law enforcement cyber threat hunter. In this session, you will see what a Threat Hunter actually does and how it is done. Will 2019 bring any real transformative cybersecurity technology advancements that will have an impact? Tune into this controversial eye opening session on what's in store for 2019 in the cybersecurity space. Data privacy is dead. Social login is not the answer. Over thirty years of cyber security internal controls have fallen short of protecting our data. Traditional identity and access management (IAM) systems, aka Web 2.0 IAM, have evolved but only exacerbates the proliferation of centralized identity repositories. Centralized identity repositories that have for decades been the “Crown Jewels” of every malicious hacker or nation state bad actor to be the gateway to our personally identifiable information. A new paradigm shift in the identity management industry is here, Web 3.0 IAM. Blockchain identity management has many names. Decentralized identity. Self-Sovereign Identity. Multi-source identity. All define the same new IAM future. An identity management system powered by distributed ledger technology. We will cover the basics of what is Self-Sovereign Identity (SSI) and this evolution of the IAM space. The webcast will showcase how one of the SSI leaders in the blockchain identity space, Sovrin, works. Sovrin.org is the leading SSI public identity network solutions in the Blockchain world. It is an open source project managed by the Hyperledger Indy project within the Linux Foundation. Mike currently works on all things security related to algorithms, protocols, and technology. I have worked in the identity and security space for many years. Ricardo is the founder of Blockchain CLT, a DLT services and solution business based out of the Charlotte, NC. He is a serial entrepreneur, human rights advocate, social impact entrepreneur and has a passion for decentralized identity (SSI). An enterprise software executive, cyber security, identity management, cloud and decentralized computing professional with almost 25 years of working experience in engineering, consulting, sales, marketing and business development roles. This session will cover one of the more important aspects of GDPR: Encryption and Tokenization. In this session you will learn the relevance of Encryption and Tokenization as it applies to GDPR and what is the difference between the two security methods. * What is a Secure Enterprise Architecture roadmap (SEA)? * Are there different Roadmaps for different industries? * How does compliance fit in with a SEA? * Does blockchain, GDPR, Cloud, and IoT conflict with compliance regulations complicating your SEA? * How will quantum computing impact SEA roadmap? This session will cover the practice of Threat Hunting, when to use it, where to use it, and the technical skills needed to effectively deliver value to an organization. This session will cover GDPR from a users perspective, examining the trials and tribulations of working towards GDPR readiness. 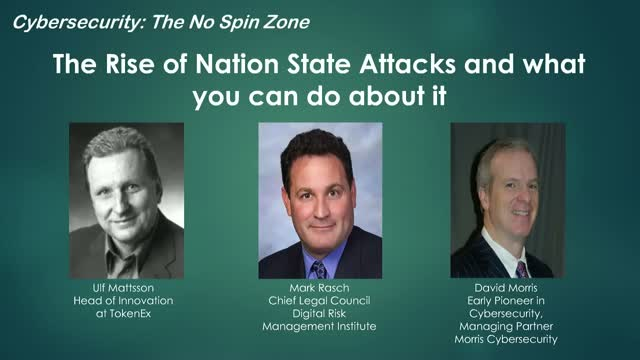 The Cybersecurity- No Spin Zone is dedicated first and foremost to educating viewers about Cybersecurity Technologies, Problems, Compliance and Legal FACTS. We are not a Vendor Sponsored Channel, this gives us the unique ability to bring you factual unbiased information and advice from subject matter experts.